This is the first mildly complicated knitting pattern I actually understand. I can knit a sock by rigidly following the pattern, but I don’t really understand how that “pocket” for the heel is formed. I do this and this and this and suddenly I’ve “turned the heel” and can see the thing that my needles have constructed. But I don’t know the why of it. 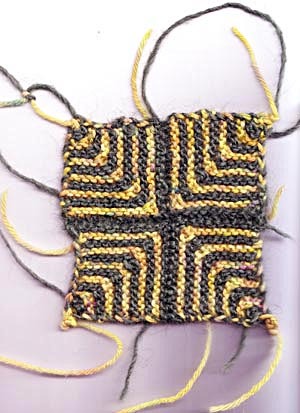 Okay, mitered knitting is not rocket science (to coin a phrase), but it is one of those sets of directions where you more or less blindly follow the instructions and you find yourself with a square in which the colors of the pattern seem to turn a corner. For those who look at the instructions in the back of Knitting Bones and scratch their heads, I refer you to page 195 of the book, in which Betsy and Rosemary – a real person, who designed the pattern – sit down and knit the thing, Rosemary talking Betsy through parts of it. Now that you have the basic method, you can extend it and make a scarf.